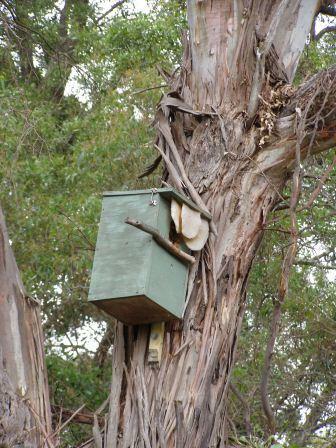 While nest boxes will never make up for having tree hollows there are many areas in the landscape where there are too few hollows left for native fauna to breed successfully. If you think your site needs to have more boxes make sure you build them out of long-lasting material and follow a pattern to design the best box for the species you want to support. Here is a link to some nest box info and patterns produced by Ballarat University (now Federation University) for a project a few years ago. There is also a Land for Wildlife program note on nest box design. Another source of nest box information is this link to LaTrobe University site. Many men’s sheds will make up some boxes if supplied with the materials, patterns and a donation for their time or you could go along and make your own box. Nest box maintenance is very important as if unmonitored, feral pests make take over and exclude local species. Some feral species are very aggressive competitors for similar resources such as nesting sites and food. Ensure nest boxes are regularly maintained to ensure they are still suitable for use by fauna. Check attachment to tree and clean out nesting material from feral birds such as mynas, starlings and sparrows where required, remove bees or wasps and check and remove dead nestlings. Make sure water is not getting into the box and that it is still structurally sound. The attachment to the tree should be designed so that the box does not damage or cut into the tree. If using wire insert it into some old garden hose to give further protection and design the attachment so that wire can be lengthened as the tree grows. Avoid screwing the box directly into the tree. It is a good idea to have a map of the locations in case someone else needs to do the monitoring.